Technology use among foreign-born Latinos continues to lag significantly behind that of their U.S.-born counterparts, according to a new analysis of survey data from the Pew Hispanic Center. The nativity differences are especially pronounced when it comes to internet use. 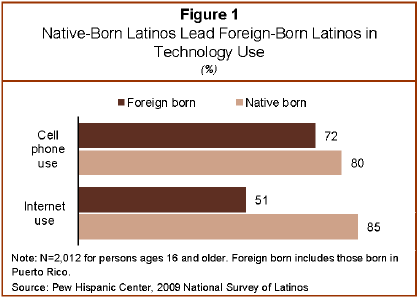 While 85% of native-born Latinos ages 16 and older go online, only about half (51%) of foreign-born Latinos do so.1 When it comes to cell phones, 80% of native-born Latinos use one, compared with 72% of the foreign born. Among youths ages 16 to 25, non-Hispanics are approaching near-universal internet use, but the rate is markedly lower for Hispanics.5 Some 95% of non-Hispanics ages 16 and 17 go online, as do 96% of those ages 18 to 25; for Hispanics ages 16 to 25, the internet use rate is 77%. The ethnic gap in cell phone use is less pronounced, though still significant. 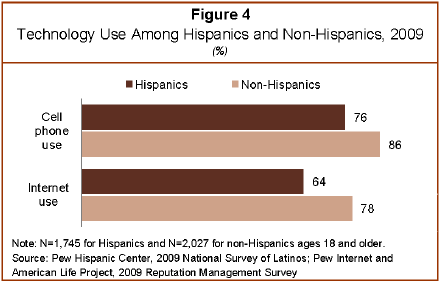 Some 82% of non-Hispanics ages 16 to 17 use a cell phone, compared with 72% of Hispanics. 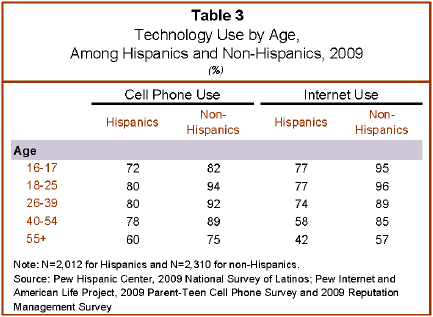 Among those ages 18 to 25, 94% of non-Hispanics use a cell phone, compared with eight-in-ten (80%) Hispanics. Just over three-fourths (76%) of Latinos ages 16 and older report using a cell phone. Cell phone use is most common among Latinos ages 25 and younger. Some 78% of Latinos 16 to 19 use a cell, as do 80% of those 20 to 25. Older Latinos are significantly less likely to use a cell—only 74% do so. 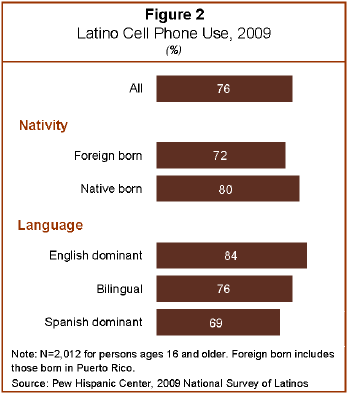 Both nativity and generation are important predictors of cell phone use for Latinos. While 72% of Latinos born outside of the U.S. use a cell phone, this share rises to 80% for the native born. And among the native born, the second generation, who have at least one parent born outside of the U.S., are less likely to use cell phones (78%) than third-generation Latinos (84%), who are the native-born children of native-born parents. Among Latino teens ages 16 to 19, the native-born are more likely to use a cell phone than the foreign born (81% versus 67%), and the third generation is more likely to do so than the second generation (90% vs. 78%). For Latinos ages 20 to 25, the native born are more likely to use cell phones than the foreign born (90% versus 70%), but there is no difference between the second and third generation. There are no significant nativity or generational differences in cell phone use for Latinos ages 26 and older. Hispanic males ages 16 and older are more likely than their female counterparts to report using a cell phone. While 80% of males use a cell phone, just 72% of females do so. But among Hispanic teens ages 16 to 19, the reverse is true—females are more likely to use a cell phone than their male counterparts (82% versus 73%). There is no significant gender difference in cell use for Hispanics ages 20 to 25, but among Hispanic adults ages 26 and older, males are the dominant cell phone users–80% versus 69%. When it comes to internet use, almost two-thirds (65%) of all Latinos ages 16 and older go online, at least occasionally. Internet use rates differ markedly between teen Latinos, those in their early 20s, and older Latinos. Fully 84% of Latinos ages 16 to 19 report that they email or use the internet. This number drops to just under three-fourths (74%) for Latinos ages 20 to 25. 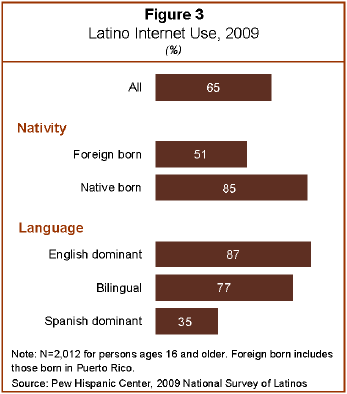 Only six-in-ten (61%) Latinos ages 26 and older use the internet at all. Nativity is closely associated with internet use. Half (51%) of foreign-born Latinos go online, while 85% of Latinos born in the U.S. do so. This internet gap is due in part to the fact that the native born are younger on average than their foreign-born counterparts. However, this nativity difference in internet use persists within each of the three age groups examined—16- to 19-year olds, 20- to 25-year olds, and those ages 26 years and older–suggesting that there are other explanatory factors as well. As is the case with cell phone use, there is a significant difference in internet use between second- and third-generation Latino teens. Some 90% of second-generation Latinos ages 16 to 19 use the internet, while almost all (97%) third-generation Latinos ages 16 to 19 go online. Internet use does not vary by generations for older Latinos. No gender differences in internet use exist among the full population of Latinos ages 16 and older. However, a closer analysis reveals gender differences within each age group. For the younger age groups, females are more likely than their male counterparts to use the internet—88% versus 80% for Latinos ages 16 to 19; and 79% versus 70% for Latinos ages 20 to 25. However, among Latinos ages 26 and older, men are more likely to report that they use the internet. Almost two-thirds (65%) say as much, compared with 57% of women. Latinos continue to lag behind non-Latinos in cell phone use. Just over three-fourths (76%) of Latinos ages 18 and older use cell phones; this number is 86% among non-Latinos.9 The same is true with regard to internet use, despite marked gains by Latinos in recent years (Livingston, Parker and Fox 2009). Some 64% of Latinos use the internet, compared with 78% of non-Latinos—a 14 percentage point difference. In general, age is inversely related to cell phone and internet use, so the relatively youthful profile of Hispanics is a demographic fact that in and of itself buoys the statistics for overall Hispanic technology use. Controlling for age shows a more precise portrait of the ethnic differentials in technology use. Among those ages 16 and 17, about seven-in-ten (72%) Latinos use a cell phone, compared with eight-in-ten (82%) non-Latinos. Eighty percent of Latinos ages 18 to 25 use a cell phone, and 94% of their non-Hispanic counterparts do the same. The ethnic differential in cell phone use is particularly notable for the oldest ages—non-Latinos ages 55 and older are 25% more likely than their Latino counterparts to use the technology, with 75% of non-Latinos, and 60% of Latinos reporting that they use cell phones. When it comes to internet use, almost all young non-Hispanics (ages 16 to 25) go online, while just over three-fourths (77%) of their Hispanic counterparts do the same. For people ages 55 and older, 42% of Latinos use the internet, compared with 57% of non-Latinos. Results for Hispanics are based on the 2009 National Survey of Latinos, which was conducted from August 5 through September 16, 2009 among a randomly selected, nationally representative sample of 2,012 Hispanics ages 16 and older. The survey was conducted in both English and Spanish, on cellular as well as landline telephones. For the total sample, the margin of error is plus or minus 3.7 percentage points. The margin of error for respondents ages 16 to 25 is plus or minus 4.6 percentage points, and the margin of error for respondents ages 26 and older is plus or minus 4.8 percentage points. See Between Two Worlds: How Young Latinos Come of Age in America for more details. Results for non-Hispanics ages 16 to 17 are based on the Pew Internet and American Life Project (PIAL) 2009 Parent-Teen Cell Phone Survey, which was conducted on cellular as well as landline telephones from June 26 through September 24, 2009 among a nationally representative sample of 800 teens ages 12 to 17 and their parents. The margin of error for the full sample of teens is plus or minus 3.8 percentage points. Race/ethnicity for the teens in this survey is based on the race/ethnicity of the parent respondent. Results for non-Hispanics ages 18 and older are based on the PIAL 2009 Reputation Management Survey, which was conducted on cellular as well as landline telephones from August 18 through September 14, 2009 among a nationally representative sample of 2,253 adults. The margin of error for the full sample is plus or minus 2.3 percentage points.